The only thing we knew we had to do on Saturday was to be at Gruž port for 4pm ready to board the fast ferry to Korčula. Somehow we had to get our bags there first; our host had suggested that he’d leave a note for his sister to ask if she could give us lift down when we left our apartment, but nothing was mentioned when we said goodbye to his mother on Saturday morning… anyway, it was all downhill, and two of the three bags had wheels, so Shanks’s pony it was. A route was carefully chosen to minimise the number of steps, and overall it wasn’t too painful to get to where we could leave our bags for the day. 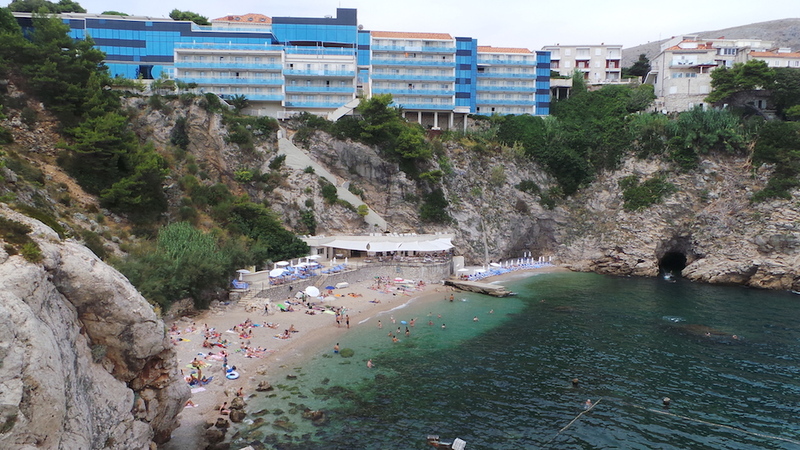 Whilst recuperating over refreshments, we came up with a vague plan which involved making use of our 24-hour bus pass to check a couple of potential beaches, one of which (Bellevue) was conveniently close to where we would have to change buses to get to the second one (Lapad Bay). After some confusion over the bus map (conveniently colour-coded… using different colours on each slightly different version), we figured out how to get to Bellevue, and a bit of navigating by instinct soon found us overlooking the beach, which was a long way down. We could see a set of steps on the far side, but weren’t sure how to get to them, so checked at the hotel that used part of the beach; they pointed us round the ‘public’ way, rather than letting us use their lift; no surprise. From where we were, we couldn’t see what facilities would be at the bottom, so we stocked up with lunch at a convenient pekarnica (bakery), then followed the directions round to what seemed like a back entrance to a different hotel, then suddenly found ourselves at the top of the steps we’d seen earlier, with a nice clear view of the beach. Not too crowded, very sheltered, even a little cave if you were feeling brave and wanted to do a bit of exploring while swimming. It looks like it sometimes has (or had) more facilities, apart from the hotel bar and restaurant, but those didn’t seem to be in operation when we were there. We did what you’d expect on a beach: cooled off (much needed!) in the sea, dried out in the sun, ate lunch, and repeat until it was time to head off and make sure we caught the ferry. Our 24-hour bus pass had expired, but we knew it was only a 15 minute walk to the port, mostly downhill, and that made it easy to stop for some supplies for on the ferry. 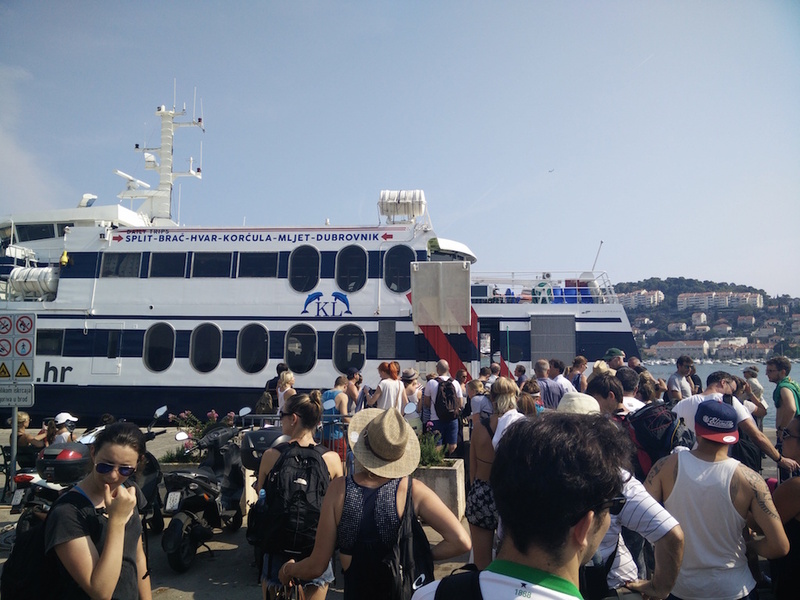 We got to the port in plenty of time, collected our bags, and found that the nearest cafe was full of people with luggage, looking like they were all waiting for the same ferry. Fortunately, we had some good timing and managed to grab a free table. and eventually managed to get the one member of staff on duty to serve us some beer while we figured out how to rearrange our shopping into our luggage. Just before the scheduled boarding time, we noticed a flurry of activity so decided we should go and join the queue; none too soon! Once we got on board and stashed our larger items of luggage, we found some seats right at the front so we could see where we were going, and settled in for the two hour journey to Korčula.